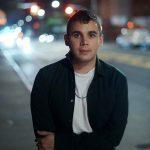 It’s been just over a year since Rostam released Half-Light, and even longer since that gem of an album he did with our boy Hambone…and it looks like he’s finally starting to move forward with new music. His brand new single has him building the song, much as one expect an artist to do over time. He opens with mandolin, letting that ride for a minute before bringing in his voice…it’s then that the lush orchestration begins to take hold as a pulsing drum rhythmically beats beneath the surface. Tension builds by way of violins, though he keeps his voice gentle throughout the entirety of the changes. For a musician trying to find that balance between indie rock and electronica…it’s been a good run for Rostam thus far.